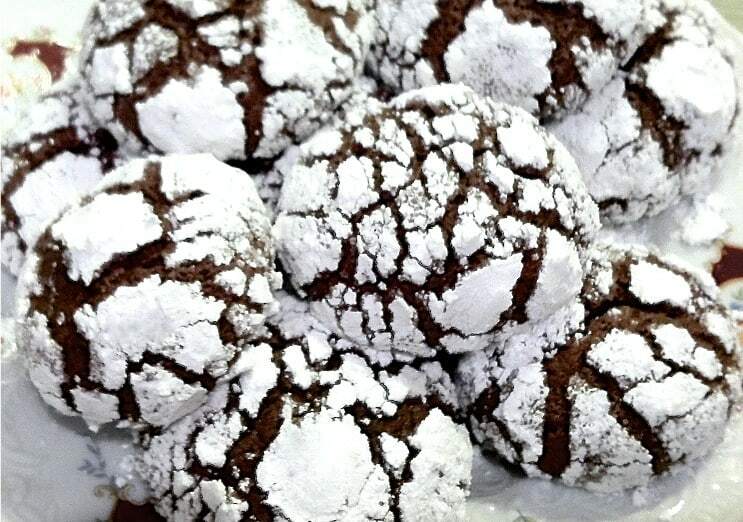 Beautiful and highly addictive snowy chocolate cookies! Crispy on the outside with a chewy middle rich in chocolate and all this sprinkled with ‘snow’ – icing sugar! A true pleasure to make and highly impossible to resist! This is the perfect christmas sharing dessert! To prepare these delicious snowy chocolate cookies, start by preparing your ingredients. In a bowl add the flour and the baking powder and blend. Melt the butter and the chocolate separately. To melt the chocolate it is best to use a bain-marie (or double boiler), a piece of equipment used to heat the chocolate gently and gradually to fixed temperatures so that it doesn’t burn. If you don’t have a Bain -marie, break the chocolate into small pieces and drop into a heatproof bowl. Set the bowl over a small saucepan about a quarter full with hot water and place the bowl on top so that it rests on the rim of the pan (the bowl should not touch the water). Place the pan, with the bowl on top, over low heat until the chocolate has melted, whilst stirring occasionally. In a bowl add the eggs and whisk with a hand-mixer until they thicken. Set your mixer to low speed and pour in the melted butter, the melted chocolate, the espresso coffee, the brown sugar, the vanilla extract and the flour (one at a time, whilst mixing). Cover the dough with some plastic wrap (the plastic wrap should be touching the dough, to prevent it from forming a crust) and place in the fridge for 3 hours. Place the icing sugar and the sugar in 2 separate plates, large enough to roll the cookie balls; preheat the oven to 200C and line two baking trays with parchment paper. Take one teaspoon of the dough, shape into a ball and roll the ball first in the sugar and then in the icing sugar. Place on the baking tray and repeat with the rest of the dough. Place the baking trays with the cookies in second and fourth grill of the oven, turn the heat down to 180C and bake for 12-15 minutes, depending on whether you prefer them chewy or crispy. Leave them aside to cool down for a while, if you can resist eating them hot from the oven.. Enjoy! I am about to make these cookies, is the cup of expresso a small expresso cup or an american cup size please? they did spread a little in the baking as a result, i guess. So next time I will try with the 1 small cup of espresso. I used good quality eating Chocolate at least 70% cocoa. Im so glad they worked out well for you and that your friends liked them! I’ve had the same problem with them spreading when cooking the first time I made them and the problem was that I had beaten the dough for too long and it had gone too fluffy (hence spreading when cooking). Try not beat just enough for the ingredients to blend with eachother but not more than that. Also another tip I’ve come across for cookies in general is to bake them on a baking tray lined with non-greased parchment paper, as butter-cookies can get really slippery when cooking and hence spread. Finally, try to cool for a little longer, this is more of a trial and error as the temperature of each fridge varies quite a bit…. Or cool the dough, shape and lay out on a tray, cool again and then bake. Thank uyou for that information I will take note next time! Happy new year to you!!! is dark chocolate the equivalent to bittersweet chocolate or semi sweet chocolate? Hi there and have a merry Christmas! Yes it’s the bittersweet kind, dark chocolate used for baking..
Hi yes I will be making these cookies for my day care parents. I do hope they turn good! I just made them with a full cup of espresso (US size). What should I do to fix / will I have to fix? My daughter needs tomorrow for a Greek dish!